The USGBC's Green Veterans program is dedicated to helping our nation's heroes learn about sustainable building and green living, while at the same time helping ease the hardship of military-to-civilian transition. By empowering veterans to be volunteer leaders in their communities, the initiative's goals are to nurture opportunities for continuing education, networking, employment, corporate engagement and green entrepreneurship. Reintegration -- The Green Veterans initiative empowers Veterans to use their military acumen to help sustain the very Nation for which they fought by collaborating with civilians and veterans alike on green initiatives. Sustainability Training -- The Green Veterans Sustainability Training Program is providing practical green education veterans can utilize to gain experience and confidence that will be valuable to prospective employers. Veteran-Oriented Service Projects -- As part of the Sustainability Training curriculum, students will connect with partner organizations to collaborate on community projects utilizing their training and military experience. Trauma Resolution Through Green Building -- Green Veterans are in the process of rolling out a Trauma Resolution Space Design Concept by implementing the WELL rating system to simultaneously affect mental well-being of the spaces we are trying to enhance. The USGBC Green Veterans program was founded by the former USGBC South Florida Chapter in 2013 by a disabled combat veteran and a longstanding USGBC civilian volunteer. These leaders asked a simple question that led to others -- How can USGBC empower veterans, helping them reintegrate into society through our green building movement? How can we provide veterans with the credentials and experience needed to be successful in clean energy, sustainable construction, health, wellness and other industries? What can we do to make a tangible difference to the USA's 25,000 service facilities and 20 million dwelling units housing Veterans? Are we not the natural community to raise awareness that high-performing, healthy buildings can and will mitigate some of the triggers associated with Post Traumatic Stress Disorder (PTSD)? Hence was born the USGBC Green Veterans program, with a core focus on empowering veterans to use their military acumen to help sustain the very Nation for which they fought and which they defended. By collaborating with civilian and veteran groups on green building initiatives, the Green Veterans Sustainability Training Program provides practical green education programs that veterans can tap to gain experience and confidence that will be valuable to prospective employers. 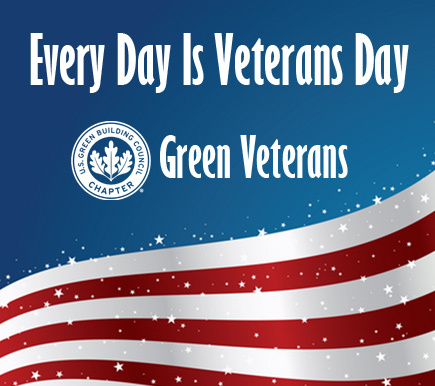 Green Veterans are growing our Chapters' volunteer ranks and strengthening our community outreach efforts. Together, we are examining trauma resolution through green building, by looking at evidence-based design and the WELL rating system to incorporate design solutions that reduce PTSD triggers through stress reduction, alleviating depression, and greater focus on comfort, security, health and access to nature. Local Green Veterans programs are diverse and productive. Amongst topics and activities, Green Veterans have discussed the realities of Post-Traumatic Stress Disorder and the role of therapeutic gardens and building design on stress reduction and PTSD treatment. They have collected furniture for veterans, and also pulled together teams to repair veterans' homes and VFW Posts. They have collaborated on local community projects (including Green Apple Day of Service efforts) with nonprofit and corporate partners. Additionally, the Green Veterans Sustainability Training (GVST) Program provides practical green-building education and experience. Following training classes for a combination of the LEED Green Associate accreditation and HERS, Resnet and BPI instruction, program participants receive on-the-job training for green-industry professions by participating in service-oriented projects with best-in-class, proven community partners. These classes -- taught by USGBC volunteers, including some veterans -- are at no cost to veterans. Each of the seven USGBC Florida Chapter's Regions have embraced the Green Veterans program in their communities, as have a growing number of USGBC Chapters around the USA. If you are interested in learning more about this important program, visit http://greenvets.org or contact info@usgbcflorida.org. through and making a difference. Please consider making a monetary donation so that we can purchase items and pay for logistics to get them to PR. 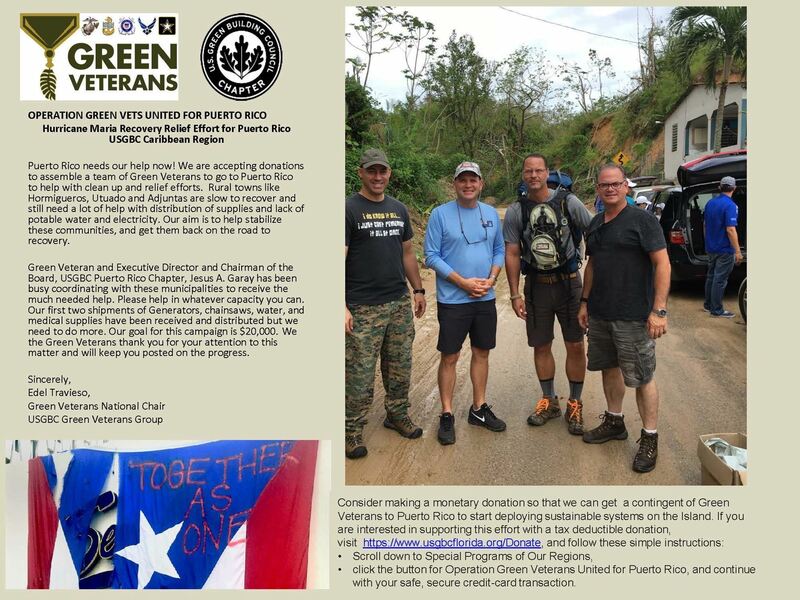 If you are interested in supporting this effort with a tax-deductible donation, visit https://www.usgbcflorida.org/Donate, scroll down to Special Programs of Our Regions, click the button for Operation Green Veterans United for Puerto Rico, and continue with your safe, secure credit-card transaction. If you have specific items to donate or have connections you can tap to make that happen, please reach out to Edel Travieso, Chair of USGBC Green Veterans. On behalf of the Green Veterans and USGBC Florida, thank you for your attention to this important matter. We will keep the USGBC Florida community posted on progress made. Thanks in advance for your support! The LEED Green Associate and LEED AP with specialty exams are available for reimbursement by the U.S. Department of Veterans Affairs (VA). Veterans, active duty service members, caregivers/ family members, dependents/ survivors and national guard/ reservists can take advantage of this opportunity.